The twin ugly problems of tribalism and election violence could easily plunge our otherwise beloved peaceful nation of Zambia into utter mayhem. This is why ahead of the August 11 Presidential elections, every citizen in and outside the country must be vigilant in denouncing these two evils. Do not take this advice as hyperbole, exaggeration or just a bored ivory tower ignorant intellectual Zambian away from Zambia who is being needlessly alarmist. I was in Zambia recently for 6 weeks during the election campaigns. I travelled to villages in Lundazi. I travelled all the way to Solwezi. I saw cities such as Kitwe, Chingola, Kalulushi, and Ndola. Since the last and this coming election, too many provocative allegations and grievances have just been boiling underneath the political surface. They may just need some incident which will be like lighting a match and the nation can explode into violence. Reports of election violence have led to a lot of finger pointing about who started or is doing it. The police appear powerless. It appears the leaders of political parties are unwilling to openly condemn and take responsibility where the violence and even some deaths have reportedly occurred due to political election violence and sometimes recklessness caused by some members of their political parties. Because the Zambian nation has never experienced the tragic dark forces of wide spread election violence, deadly conflict or war since independence in 1964, it is easy for leaders and the entire nation to be complacent and assume that it cannot happen to us. We should never fool ourselves specially leaders of the political parties. The most recent example is the post-election violence that occurred in Kenya in 2007-2008 between the Kikuyus and Luos and many other so-called tribes. Hundreds were killed and perhaps thousands displaced trying to escape the violence. We should all be aware that it can happen in our country. 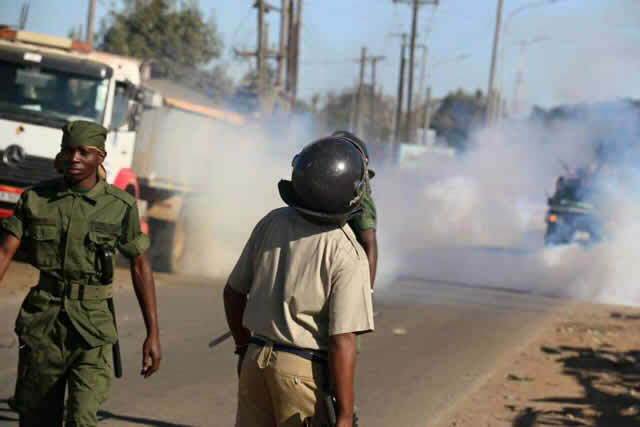 It can happen if from the top political party leaders all the way to the cadres in the streets and villages no one is loudly warning and advising everyone that political election violence is unZambian. The citizens of Zambia and leaders need to know why tribalism and its twin evil of racism that Europeans hatched, have always led to unimaginable torture, violence, and liberation wars. I have been privileged in my long college or University teaching career to have studied the causes of tribal, racial and ethnic conflicts all over the world especially since European colonialism in the world over the last 300 years. Europeans created racism to justify the exploiting and oppressing of non-European peoples all over the world including in Africa and Zambia. There is no scientific or social evidence that a white person is inherently superior to a black person because of his or her race or white skin color. There is no scientific or social evidence that a black person is naturally inferior to a white person because of his or her race or black skin color. Any social and economic differences between the races were and are socially created or constructed and maintained. This is the most difficult idea to see and appreciate because most of us do not know what we don’t know. The same argument applies to tribalism in Zambia and all of Africa today. There is no one tribe in Zambia of the 72 tribes that is naturally superior to all other tribes. There is no one tribe that is naturally inferior to all other 72 tribes in Zambia. All the tribal differences you might see in Zambia whether political leadership, education, levels of development, regional differences in development, and many others were all socially created or constructed. This means as a nation we can together fix or find solutions to those problems in order to eliminate the tribal differences. Many nations in Africa alone have experienced tremendous racial and tribe-based turmoil, violence, deaths and sometimes war due to deeply entrenched racial, tribal, and religious differences. But not we Zambians. The Biafra War in Nigeria was from 1967 to 1970. It was the Igbo fighting the rest of Nigeria. Somalia was torn apart in the early 1990s. That country has not recovered. The Tutsi and Hutu tribal conflict in Rwanda led to the 1994 genocide in Rwanda in which 800,000 people were killed. This tribal conflict went back to the 1850s. There has been unimaginable religious violence among Christians and Muslims in the Central African Republic. White Rhodesians caused the deadly war in Zimbabwe and then the tribal conflict that followed after independence in 1980 was tragic and deadly. South Africa and the whites created the deadly racist apartheid policy which has left deep scars in that nation. The list is long of these tribal conflicts. Why not Zambia? Zambia is both lucky and blessed. Soon after Zambia’s independence in 1964, the small number of white die hard racist settlers fled to mostly Rhodesia and racist Apartheid South Africa at the time. Those few whites did not like that Zambia had come be ruled by black Africans. That was lucky for us. Then our founders made one of the best, and wisest decisions in the whole world: they wanted Zambia to be a non-racial and non-tribal society. They did not just engage in mere slogans or talk. They went ahead and implemented the policy in education, government, political leadership, hospitals, entertainment, national broadcasting, the police, the army, the air force, higher education and all avenues of the Zambian life. The leaders relentlessly preached love and tolerance among all of us among the 72 tribes. This is why today Zambia is probably the most peaceful and well integrated society not just in Africa but in the world. If any of the developed countries were as well integrated as we are, they would be boasting about it everywhere. We would be reading about it in all textbooks from Grade One to University level. Because many of us Zambians do not know what we don’t know, we may take the peace and tranquility for granted. We may engage in incendiary rhetoric, election and other violence not knowing that we have it so good. Other nations in Africa and the world do not have it that good. This is why during these coming elections let’s all be very vigilant, exercise restraint and carry this peace forward. The peace we enjoy is the best gift and heritage our founders could have given us as a nation. Tribalism and the Tonga People, A Curse or a Natural Phenomenon? Mwizenge, pump this message into Kaponya (HH) also known as Kalusa, pump that message into GBM and Kaponya’s nephew Lloyd at Zambian Witchdoctor. Pump that message into the dull UPND cadres like Dull Commentator. We at PF are spotless and non-violent. President Lungu preaches against violence everyday so we have no violent cadres. You are right, you do not have violent cadres. Whole party is composed of criminals, rapists and murderous human rejects like yourself. Danger is to write about it. Explaining just piss people off, if I was in same bar with Muzinge kuti namupinona. Mr Kudos or whoever you are (you can hide behind these pseudonyms), it is time you stopped your stupidity and listen to voices of reason for a change. The author is a sociologist who has researched his stuff around the world. When warnings like these are made public, it is important to consider the log in your eye before you deflect it to some speck in somebody else’s. As a PF voter (both past elections), I can clearly see the unparalleled arrogance and descent into banana republic behaviour that this administration under Lungu has brought Zambia to. It is time to stop it and take the path out of imminent chaos. You cannot be telling us here that “We at PF are spotless and non-violent.” Whatever Lungu preaches does not match what he is doing and people are judged by deeds, not words. We know you have nothing left in that skull so save us us from hallucinations. The writer is just waffling and not getting to the point.The fact is It is Lungu and PF who are promoting tribalism and regionalism In Zambia for their selfish political reasons. Lungu is preaching uneven devt based on political support. It is Lungu’s people who are preaching “Wako niwako” or “Kumodzi kumaawa” all for political expediency. The only party with a Plan to maintain and promote One Zambia One Nation is UPND. Let’s vote out Lungu and his tribalists and regionalists in PF. Forward with HH,GBM and UPND. I concur with you, Lungu is the one who is so desperate. Why does he want others to concede defeat before casting any vote.What makes him think he has already won these elections? Even in the last election Lungu did not win the elections, that’s why it took ECZ time to announce the results. In an election anyone can win not only him. We don’t want war in Zambia just because of Lungu. Presidents come and go. You have already made yourself rich. Very true HH should stop preaching mayhem, armagedon & chaos. I have never hesrd him condemn violence instead he and is stooges always distance themselves even when the circumstances is very clear? Do us the Bembas ever consider that we are worse then the people that we call tribalist. Am a bemba married to a Tonga woman and have a big farm in my wife’s village. 2. Its okey to Speak Bemba in the government offices in provinces where bemba is not their main tribe. 3. Its okey for Lungu to claim he has won the elections even before the elections. How does he know the result before even elections. I am Bemba too and agree with you. If you see people giving props to Lungu, most of tje are Bembas. I have always said, we Bembas are most tribalist group of people in Zambia. We have derogatory names for just about any tribe you can think of. We never wanted to inter marry na baLubale, ati bakolope fimbusu, abaOnde ati banang,ani. AbaTumbuka ati batulo.and the list goes on.The pushback we are getting today has a lot to do with the load of insults we have piled on other tribes from precolonial times. We need to give it up! Stop the nonsense. We sold the concep of cousinship to all but on tribalism, bane let’s quash it. @5 Mary Zimba,(ZIMBA- Bemba married to Tonga lol!). Sata got 80% in 2011 in Luapula coz he had been on the scene for a long time and has had 9 out of 15 MPs in the province from 2006. Sata had previously lost Mwanawasa,RB in some Bemba speaking areas. In 2001 Mazoka scored higher than Sata in many areas where PF is now popular. After Sata some Bemba tribalists felt they were entitled to take over PF but reason prevailed and Lungu was chosen to bring unit in the party. Those bitter tribalists have left and joined UPND were they see things in regions and ethnicity-“GBM is VP to get a Bemba vote” and GBM says “dont’ vote for Lungu coz he has taken VP to Lozis”.If BEMBAs VOTE LUNGU and MAMA INONGE is coz THEY ARE NOT TRIBAL like others we know…!! Prof you are mediocre and dull instead of just saying it as it by pointing put that Lungu must stop the violence at once you are going round massaging the issue and say politicians must stop the violence. How do you understand leadership kanshi? Other politicians and leaders have been defending themselves from Lungu and his criminal cadres. Very dull professor indeed. Lungu is the author of this violence. The Police are being uses to orchestrate violence to maintain Lungu in office so that together with his minions they can continue looting the country. Lungu must go for us to be peaceful. Humble Christian my foot! We need war so we start respecting each other like in Rwanda.Yu call yo selves the majority but war has no majority.We can not continue with voting for one tribe in Zambia for ever.no bane it time the fomular changes. @10 Mumbotwa, Have you been to Rwanda? Is leaving in fear called respect? What same tribe have you been voting for? KK (parents from Malawi,grew up among Bembas-not bemba),FTJ (Lunda/Chishinga),Mwanawasa (Lenje/Lamba),RB(Chewa),Sata (Bisa),Lungu (Tumbuka…) so which same tribe are you referring to? When FTJ was about to leave power there was a scramble, BY,Sata wanted to take over but he told them they needed to be sensitive and that it didn’t mean that if he left another Bemba speaker would take over. When his 3rd term failed he settled on Mwanawasa(Bantu Botatwe). So your complaint seems unfounded..May be you are referring to those who have been massively voting same party since 2001 where presidency preserved for a certain ethnic group?! I have marked the Prof’s paper and I have given it 58%. While the paper is well articulated in terms of recent outbreaks of ethnic conflict in Africa, it is rather flawed in that it does not come out strong to mention that at the core of these conflicts is often the issue of socio and political exclusion as well as the hegemonic holding of state power which is ultimately used to ethnically manipulate the masses to the detriment of nation building and nationhood. this time around we need to teach the tongaland people a lesson. Last years election surely how do you vote 14000 to 0.